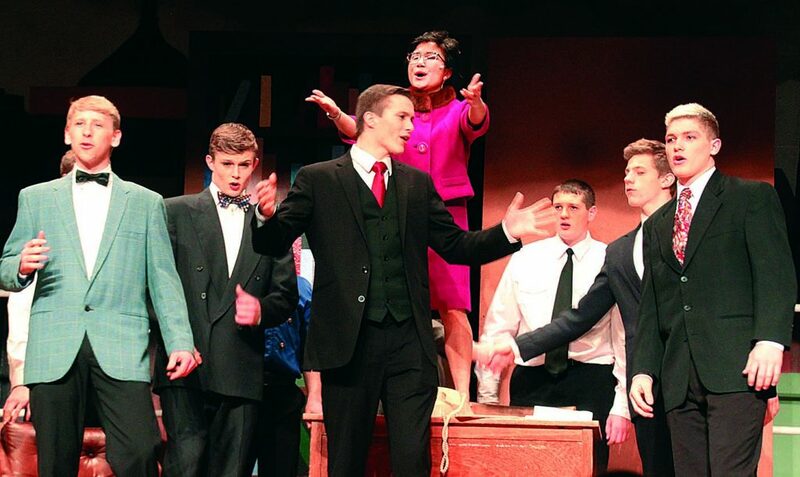 BROTHERHOOD OF MEN — Performing the ‘Brotherhood of Man’ in one of the final scenes from How to Succeed in Business Without Really Trying were (l.-r.) Caleb Kohl (Bud Frump), Seth Wright (J. B. Biggley), Scott Wright (J. Pierrepont Finch), Miss Jones (Mariah Olson), Garrett Rasmussen, Gage Groeteke (Gatch) and Ethan Dozler (Wally Womper). More photos on page 11. Last Saturday night and Sunday, Boone Central students delivered an entertaining and uplifting rendition of the musical, How to Succeed in Business Without Really Trying, a Pulitzer Prize and Tony Award-winning show about the triumph of the common man amid the buffoonery of big business. There were over 60 cast and crew members for this year’s production. Lead roles included: Scott Wright as J. Pierrepont Finch; Gage Groeteke as Gatch; Seth Wright as J.B. Biggley; Katie Goodwater as Rosemary; Stephanie Wright as Smitty; Caleb Kohl as Bud Frump; Abby Mousel as Hedy; Mariah Olson as Miss Jones; Jonny Lindgren as Bratt/Book Voice; Julia Nore as Miss Krumholtz; Brian Mock as Mr. Twimble; Ashley Mewhirter as Ovington/TV Announcer; Ethan Dozler as Wally Womper; Gavin Dozler as Policeman; Abby Brodersen as Scrubwoman 1; and Lauren Kohtz as Scrubwoman 2. Director Michele Wright said she is extremely proud of the entire team. Wright said she has enjoyed seeing growth in the students over the course of the musical season. Attendance was estimated at just over 300 people for both performances.